It appears sadly impossible not to comment on Brexit at the moment; the astonishing scale of the government defeat in Parliament yesterday and the appalling self-serving behaviour of politicians on all sides compels attention. The first and most obvious point is this; had Theresa May any honour, she would simply resign after her major political objective was rebuffed so dramatically by the legislature. But honour appears to be entirely out of fashion, so I shall not refer to it again today. Parliament now appears ready to vote that it has confidence in the government when, clearly, it does not. This is because MPs wish to keep their jobs and careers intact. So from hereon the UK proceeds under the lie that it has a government which has a majority in Westminster for its views. Even more remarkably, Theresa May has no intention of seeking a proposal that could command a majority. She seeks to move forward with cross-party discussions which exclude the leadership of other parties. She also insists that such discussions must be limited by her infamous “red lines” – but within those constraints, there is no deal materially different to the deal Parliament has just rejected which will ever be available. The truth of course is that May’s “red lines” were in fact motivated by the only consistent strand that can be traced through Theresa May’s political career – hatred of immigrants. If you are going to end freedom of movement, then you have to leave the single market. That is very plainly the rule on which the single market was predicated, and the EU have repeated that ad nauseam in all negotiations. You cannot “cherry pick” to end free movement and keep free market access. All of May’s “red lines” can be traced to a single source. If you ask “If you end EU immigration, what are the necessary consequences?” you get May’s red lines. Their basis is racism. Both the SNP and Labour parties had put forward ideas that were broadly compatible. The Labour Party wants customs union, effective single market participation, and retention of worker and environmental protections. The SNP suggested permanent customs union and EEA membership. With minor differences, both these approaches are broadly “Norway plus” and both would limit the effects on the economy and remove the need for a hard border with Ireland. But there was one major difference. The SNP accepted that single market membership must entail freedom of movement, and boldly argued that EU immigration is a good thing. The Labour Party position is entirely dishonest and predicated on a pretence that you can have single market access without freedom of movement – a position which is a lie. The Labour Party has a large number of voters frequently described as “white working class”. The phrase is continually deployed as an euphemism for “racist”, which is highly unfair to the very many white working class people who do not share those attitudes. The desire not to alienate what I prefer to call the “John Mann voter” causes many in the Labour Party to adopt this dishonesty about the immigration consequences of single market access. But it is worse than that. Many at the heart of what I might call “Old Labour” still harbour the dark thoughts that led in my youth to support from many trade union members for the views of Enoch Powell – the idea that immigrants depress wages and damage the working class. Unfortunately both Jeremy Corbyn and John MacDonnell, for both of whom I have much respect in general, still harbour this dinosaur opinion. Here Jeremy is putting forward a line on immigration “a managed thing on the basis of skills required” that is identical to the Tory line and plainly rules out free movement. Further he is promoting anti-immigrant myths. The economy is not a thing of fixed size with a limited number of jobs. Dynamic EU immigration has been entirely responsible for all growth in our economy this last decade; without it we would have been plunged into the deepest and still continuing recession. The cause of poverty is the obscene proportion of national wealth looted by the super wealthy, not the poor immigrant. The answer to the particular question Jeremy addressed is the establishment, or possibly post-Thatcher re-establishment, of strong legal protections for working conditions in the construction industry, to protect all workers there. The answer is not to attack Central European immigrants. Until the Labour Party accepts the need to challenge anti-immigrant views head-on, it will continue to talk nonsense on Brexit. For good measure, Nicola Sturgeon also played politics with a statement after last night’s vote which, remarkably, did not mention the word “Independence” at all. 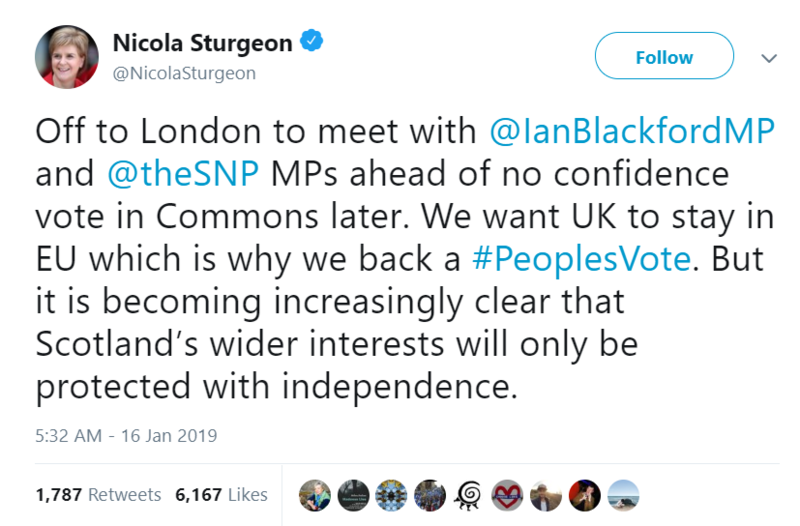 Sturgeon now appears entirely focused on keeping England and Wales inside the European Union against the will of the English and Welsh people, as opposed to having a clear and fixed aim of achieving Scottish Independence from this debacle. It seems to me the ultimate solution is plain. Scotland should become Independent and remain in the EU as its citizens overwhelmingly wish. England and Wales should leave the EU as its citizens wish (by a very clear majority if you take out Scotland and Northern Ireland). England and Wales should move to a Norway style relationship broadly as proposed by the Labour Party, with the racists told they cannot have everything they want. Northern Ireland should finally return to Ireland. Some bits of that will happen sooner than others – Scottish Independence in particular – but in a decade or so, I expect all that will have finally happened. If politicians were not so conniving and self-interested, we could get there a lot sooner. I’d like to take each portion of your argument in turn here. 1. “The economy is not a thing of fixed size with a limited number of jobs”. This is clearly a matter of opinion. To be honest it seems very unlikely to me that your statement is true. Of course it cannot be proven either way. I strongly agree with this, although it’s likely not the sole cause of poverty which your statement seems to imply and nor is poverty an inevitable consequence of our admittedly deeply unjust society. It is still possible not to be poor without joining the looters, although it is definitely becoming harder. Ahah! I detect the hand of Boromir again. Use the enemy’s weapon against him. Centralize power and use it to help the poor! Clever! Only it isn’t. It doesn’t work. It never works. Because of course, power, once centralized, is always siezed by precisely the people you want to guard against: the super wealthy. And they happily wield it to their own benefit. I would suggest that the answer to Jeremy’s question is not the vain attempt to protect the poor by centralizing power and creating merely another weapon to be turned against the very people you want to correct, but to remove the regulations and legal protections the super-wealthy depend upon to loot the economy: limited liability, fiat currency, intellectual monopoly (oops – property), income tax, and the power of government to regulate peaceful activity. These are the mainstays of the looters. Remove them and the undeserving will fall. I agree that it is neither a “good” answer in any moral sense, nor the best answer in an efficacious sense. It is however true that it likely would have some impact. Reducing the supply of labor would inevitably raise its price. “England and Wales should leave the EU as its citizens wish” Except London, of course. I don’t think that calling white brits or assuming that such are racist as this it’s self indeed is a racist and offensive suggestions ? After saving the world from a Nazi invation WW11 and having even that taken away from the British People only to become a National Socialist State open to any and all from around the world, I think you may actually of miss understood Enoch Powell’s original speech and clearly the wishes of the British People who are resigned to now have nothing more to do with the illegitimate British State. This you will see unfolding at the lack of voter turnout and will continue to climb over the coming years. You will also see many form’s of Underground movements starting up due to Witch hunts past and current are firmly too blame coupled with the total lack of Political Represntation for the British People over many Decades.This will not be solely limited to the alleged Far Right eaither. I’m in my 50’s now and have suffered Racist Abuse from every Coloure and Diverse Creeds the UK has to offer including my own Indigenous White Brits, This is simply a fact of life and unless people drop the Fabricated Media Word “ Racict “ We will simply never be able to move forward from this point and the Left and Right will remain Bitterly Devided Leaving the Ruling Elite to continue there rule of Terror Indefinitely.